Scholarship information and applications are emailed to colleges and high schools in Oregon and Southwest Washington at the beginning of winter term. Applications must be submitted to the ONF office or postmarked by April 1 to be eligible for consideration. The ONF Board generally meets each spring to award scholarships, and successful applicants are notified soon after. Check out the ONF scholarship winners over the past few years. $1,000 to a four-year or community college student majoring in horticulture or related fields who also graduated from an Oregon high school. Preference will be given to a Willamette Chapter member, member's child or an employee of a Willamette Chapter member. $1,000 to a student currently enrolled in a college horticulture program in Oregon. Preference goes to a student who intends to work in a horticulture related industry, either as an employee or as family member of a business. $500 to a college student majoring in horticulture with emphasis on greenhouse/floriculture areas. Preference will be given to family members and employees of the OAN Greenhouse Chapter. $500 to a qualified student majoring in horticulture or botany. Preference will be given to students attending Oregon schools. $1,500 to a student beginning college studies in an ornamental horticulture field. $1,500 to a student currently enrolled in a college horticulture program in Oregon. Scholarship award will be based on letters of recommendation from nursery professionals or people affiliated with the nursery industry, including nurserymen, extension, instruction, OAN members and any individual employed by a nursery. Applicants will be evaluated on the promise and commitment they show toward making significant future contributions to the nursery industry. $500 to a junior or senior college student majoring in horticulture, landscape architecture or landscape construction who also graduated from an Oregon high school. Preference will be given to a student from the Emerald Empire (Eugene) area. $550 to a student majoring in ornamental horticulture who plans to work in the ornamental industry either as an employee or as a family member of a business. $500 to a college junior or senior who is attending Oregon State or Cal Poly San Luis Obispo and majoring in horticulture. Larry Fitzgerald graduated from Cal Poly and was in the nursery industry for over 35 years, active in CAN, OAN and IPPS. He would share his knowledge with anyone who asked and was considered a "Walking Western Garden Book". 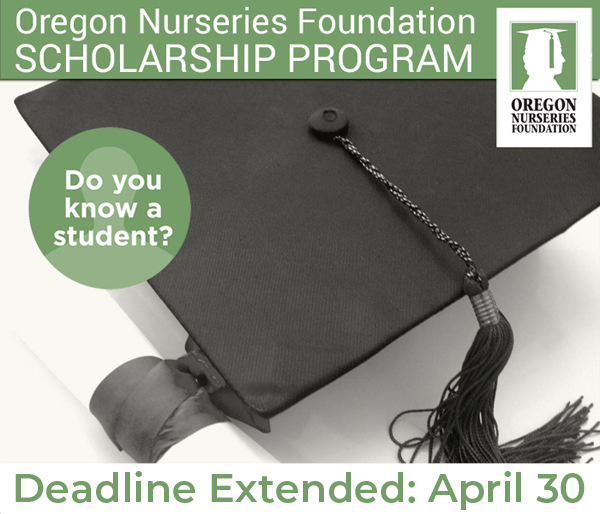 The recipient of this scholarship should be dedicated to entering the nursery industry. $1,000 to a college student majoring in ornamental horticulture. Preference will be given to applicants from nursery areas east of Portland. $500 to a college student in ornamental horticulture who is employed by an OAN member firm. $1,000 to a student majoring in the field of horticulture. $1,000 to a graduate student in ornamental horticulture. $1,000 to a student majoring in ornamental horticulture and related fields. Preference will be given to students who are a son/daughter of an OAN member retailer, or one of their employees. $1,000 to a student majoring in ornamental horticulture and related fields. $1,000 to a four-year or community college student majoring in horticulture, floriculture or turf related studies who graduated from an Oregon high school. Preference goes to a student who intends to work in a horticulture related industry, either as an employee or as a family member of a business. $1,500 to a college student majoring in ornamental horticulture. Preference will be given to a Willamette Chapter member, member's child or an employee of a Willamette Chapter member. Recipient will be required to attend a Willamette Chapter meeting to discuss his or her career goals.